As a Supplier to the Big 4 UK Supermarkets you’ll be challenged regularly to be better. In fact, to achieve Supplier Excellence. Reminded that as a Supplier you’ll need to ‘bring your A game’ and be told that other Suppliers are achieving excellence in certain areas. Therefore your challenge is to ‘raise your game’. 2,000 – I have sat on both sides of the fence in this many Supplier meetings. 500 – I have worked with this many Suppliers on both sides of the fence. £1bn – My last responsibility was for this much sales in one of the big 4 UK Supermarkets. In that time I have seen Good, Better and Best Suppliers. My intention is to help you achieve the latter – Supplier Excellence. To be a Supplier we’ll assume that you have great products, low costs, and able to meet the minimum technical, logistical and account management requirements to be a Supplier to one of the big 4 UK Supermarkets. Don’t Bother Achieving Supplier Excellence? You could. Many Suppliers achieve a good business as ‘plodders’. Happily telling the Buyers that they ‘don’t do Category Management‘, or, ‘They just want to supply xyz and not do all the other stuff. We’re lean’. It is a valid choice. Just bear in mind that as a ‘plodder’, you’re a follower. You cannot expect to be briefed first on NPD, be on the inside track, and you’ll need to follow the lead that other suppliers set. This is a risky position to be in. In short, it’s the 3 legged stool principle. You, the Supplier, working with the Supermarket, and the Shopper, to achieve win:win:win. 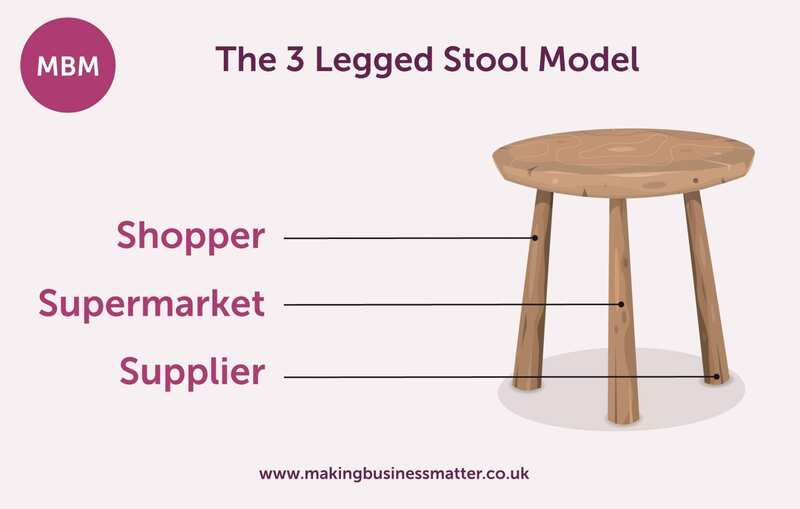 The 3 legged stool. Yes, the Supermarket may seem to win more and you lose more, but ultimately it is the only model that works. Stephen Covey, the author of ‘The 7 Habits of highly Effective People’, talks in Habit #4 about win:win. His description challenges the reader in a shop owner scenario that if the shop owner wins, always making decisions that are best for him, he will soon lose his customers. Or if he makes decision just about his customers, he will eventually make a loss and go out of business. Striving for win:win:win is has to be the mindset because anything else ultimately fails. This mindset must be shared across all functions. It is not the responsibility of just the Commercial Team to solve the Shopper and the Supermarket’s challenges. Every function must understand the what, why, when, which, who, and how of the Shopper if you want to achieve Supplier Excellence. Action: Identify the Opportunities, e.g. Getting Shoppers to buy more frequently, and share the £xm gap with the team. Then build on this with a one page pen portrait of the Shopper to bring the opportunity to life and get everyone involve thinking like your Shopper. Imagine a pizza. Maybe a Goodfella’s deep base, or a Pizza Express Sloppy Giuseppe, or one you’ve made yourself. This will help. We’re going to build one together to understand that there are 7 key parts to achieving Supplier Excellence. Getting these 7 parts right is essential. To bring this to life in Supplier Excellence terms I ask you to review the latest Shopper research that your business did. The Shopper is likely to say that there is no great difference between the range in one Supermarket versus another. My example of the ‘whole team mindset’ that is essential to achieving Supplier Excellence, is of a Technical team at a Supplier. They identified that removing the hydrogenated fats from ready meals would provide the point of difference that the Shopper wanted. To bring this to life in Supplier Excellence terms we were working on a Counters project for a Client. The Supplier was concerned about their falling sales on Deli Counters in a Supermarket. We encouraged one of the production guys to come into store and follow the process of carving and slicing meats in-store. He noticed that the stores were slicing ham at different thicknesses because they do slicing in the factory and he knew about slicing. Sure enough, we went to 10 stores and asked them for 3 slices of Wiltshire ham. Lining-up all the packs we were charged from £1.10 to £1.81. In one fell swoop a production guy had identified a £xm opportunity that cost no more to do, the Shoppers wanted a thicker slice, and was implemented in 2 weeks by each store by using the same dial setting on their slicer. To bring this to life in Supplier Excellence terms let’s consider HR. Some HR departments at our Clients have updated their Category Manager descriptions to include a measure on the number of opportunities landed. The industry average percentage of opportunities taken to the Buyer and then successful landed in-store is only 27%. Three quarters are lost. Imagine recruiting and training people on they ability to identify and land opportunities! To bring this to life in Supplier Excellence terms I want to share a story of bagged salads. Working with this Supplier they wanted to put clear blue water between themselves and their competition. Together we distilled the Shopper research into 5 key decisions that the Shopper makes when they stand in front of the range at the fixture. 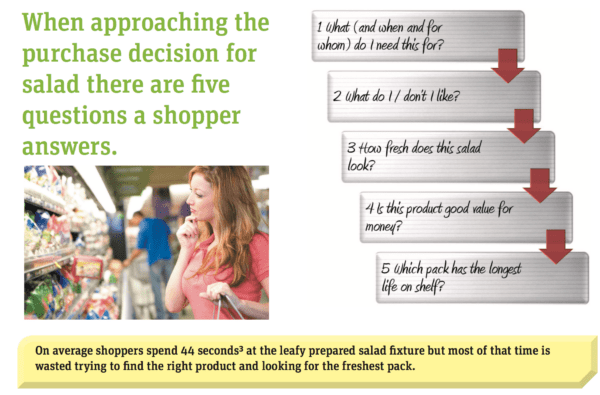 This helped every person involved in making decisions about the range to know what is important to the Shopper. Then they dug deeper to understand what each of the decisions really meant. For example, ‘How fresh does this salad look?’. The answer stunned everyone involved in the research and was carried right through production to offer a more fresh salad on shelf. But it’s a well kept secret! 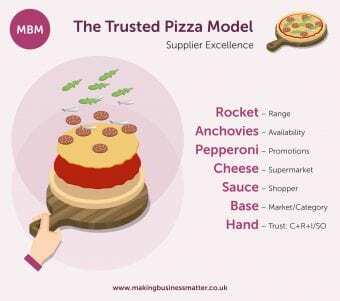 To bring this to life in Supplier Excellence terms please consider frozen foods. Frozen foods have always struggled with space because most of it is taken up by chips and peas. Things that don’t make much money. The packaging team at a Supplier came up with the idea of creating landscape/portrait packs. On the back was landscape and on the front was the same packaging in portrait. This meant that stores could choose to display the packs either way depending on what freezer cabinets they had. The idea seems obvious now when you think of it, and a great example of internal facing team coming up with a solution to solve an external problem – that’s true Supplier Excellence. To bring this to life in Supplier Excellence terms I let’s talk about the cost of promotions. Of the 500 Suppliers I mentioned at the start only 1 has ever understood how much their spend on promotions and their return on investment. How about if we knew that we spend £2.5m on promotions and only get back £1.1m? A £1.4m loss. Would Finance be interested to understand and help with that? A typical promotion plan is to promote what you promoted last year. I suggest instead of a drain on cash it could deliver a positive ROI and ideally deliver a benefit for the legged stool, where you, the Supermarket and the Shopper wins. Rather than just switching the Shopper from one product to just a different product in your category. Action: Download the Competency Frameworks and see how you measure up?